After closing an investigation into a fatal crash between a Tesla driver using Autopilot and a tractor-trailer, the U.S. Department of Transportation has found no safety issues with the semi-autonomous driving technology. The federal investigation by the National Highway Traffic and Safety Administration (NHTSA), which included crash rate data provided by Tesla, found that vehicles using Autopilot features were actually 40% less likely to crash. The NHTSA examination did not identify any defects in the design or performance of either the Model S sedan or Model X crossover SUV's automatic emergency braking (AEB) or Autopilot systems, nor any incidents in which the systems did not perform as designed. Tesla's Autopilot system is an Advanced Driver Assistance System (ADAS) that the company has repeatedly warned owners requires the continual and full attention of the driver to monitor the traffic environment and be prepared to act to avoid crashes. Tesla's design included a hands-on the steering wheel system for monitoring driver engagement. That system has been updated to further reinforce the need for driver engagement through a "strike out" strategy. Drivers that do not respond to visual cues in the driver monitoring system alerts may "strike out" and lose Autopilot function for the remainder of the drive cycle. 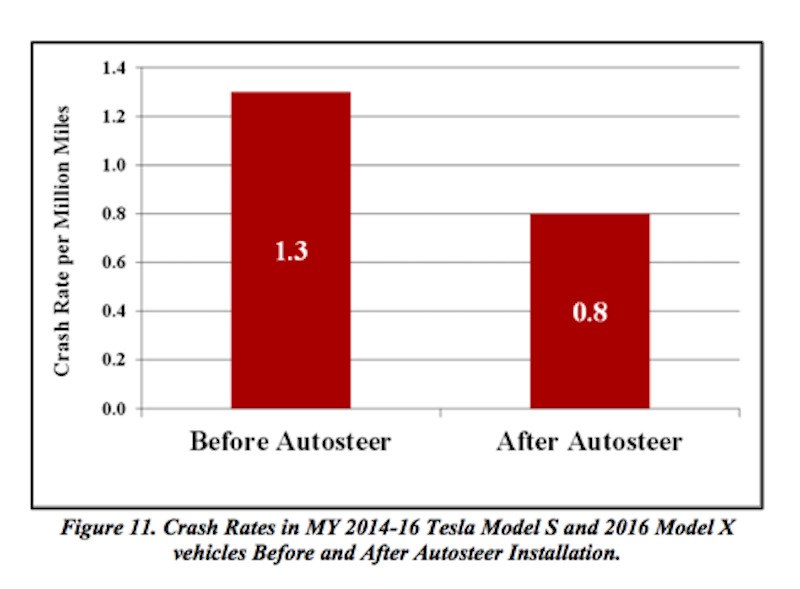 After being given crash data by Tesla, which compared cars with Autopilot and those without, the investigators determined installing Autopilot prevents crashes by 40%. In November, Tesla offered an over-the-air software upgrade to vehicle owners that improved Autopilot, including the requirement to have their hands on the steering wheel more often. The upgrade also increased Autopilot's reliability through increased use of radar, cameras and ultrasonic sensors. Tesla CEO Elon Musk at the time said the software upgrade would have likely allowed the Model S involved in the fatal crash to avoid broadsiding the tractor-trailer since it would have likely detected it. In July, the National Transportation Safety Board (NTSB) released a preliminary report that detailed the circumstances of the fatal accident involving a Tesla Model S driving with its Autopilot engaged. The accident, which took place May 7 in Williston, Fla., was the first known fatal crash involving a vehicle using ADAS based on computer software, sensors, cameras and radar. The all-electric Tesla hit the side of an 18-wheeler that turned left in front of it. 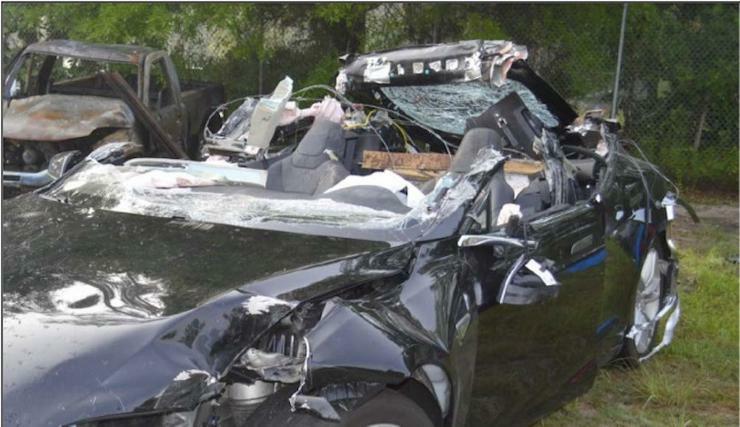 The impact sheared away the roof of the Model S and killed Joshua Brown, 40, of Canton, Ohio. The NTSB report at the time stated that Tesla system performance data downloaded from the car indicated that the Model S' speed just before impact was 74 mph, nine miles an hour over the speed limit on the four-lane, divided highway. The Autopilot's Autosteer lane-keeping assistance and traffic-aware cruise control system was engaged at the time of the crash. "The car was also equipped with automatic emergency braking that is designed to automatically apply the brakes to reduce the severity of or assist in avoiding frontal collisions," the agency said. and peer vehicle were able to achieve crash avoidance in a majority of the rear-end scenarios tested. The report said that Autopilot's adaptive cruise control also "generally provided enough braking to achieve crash avoidance." NHTSA cautioned that the closing of its investigation into a single crash "does not constitute a finding...that no safety-related defect exists. The agency will monitor the issue and reserves the right to take future action if warranted by the circumstances."